Managing microservices in containers is typically done with Cluster Managers and Orchestration tools such as Google Kubernetes, Apache Mesos, Docker Swarm, Docker Cloud, Amazon ECS, Hashicorp Nomad just to mention a few. However, each platform has slightly different of options to deploy containers or schedule tasks to each cluster node. This is why we started a Series of blog post with Docker Swarm Monitoring, and continue today with a quick tutorial for Container Monitoring and Log Collection on Kubernetes. Before we start looking at Kubernetes, check out two useful Cheatsheets. Kubernetes is one of the most popular and stable management platforms for Docker containers – it powers Google Containers Engine (GCE) on the Google Cloud platform. In Kubernetes, a group of one or more containers is called a pod. Containers in a pod are deployed together, and are started, stopped, and replicated as a group. A pod could represent e.g. a web server with a database that run together as a microservice including shared network and storage resources. Replication controllers manage the deployment of pods to the cluster nodes and are responsible for creation, scaling and termination of pods. For example, in case of a node shutdown, the replication controller moves the pods to other nodes to ensure the desired number of replicas for this pod is available. Kubernetes services provide the connectivity with a load balancing proxy for multiple pods that belong to a service. This way clients don’t need to know which node runs a pod for the current service request. Each pod could have multiple labels. These labels are used to select resources for operations. For example, a replication controller and services discover pods by label selectors for various operations. The high level of automation for the container and microservice lifecycle makes the monitoring of Kubernetes more challenging than in more traditional, more static deployments. Any static setup to monitor specific application containers would not work because Kubernetes makes its own decisions according to the defined deployment rules. It is not only the deployed microservices that need to be monitored. It is equally important to watch metrics and logs for Kubernetes core services themselves, such as Kubernetes Master running etcd, controller-manager, scheduler and apiserver and Kubernetes Workers (aka Minions) running kubelet and proxy service. Having a centralized place to keep an eye on all these services, their metrics and logs helps one spot problems in the cluster infrastructure. Kubernetes core services could be installed on bare metal, in virtual machines or as containers using Docker. 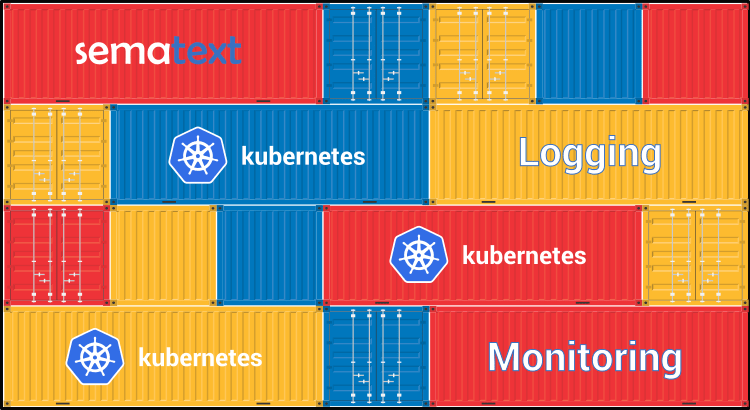 Deploying Kubernetes core services in containers could be helpful with deployment and monitoring operations – tools for container monitoring would cover both core services and application containers. So how does one monitor such a complex and dynamic environment? There are a number of open source docker monitoring one can cobble together to build a monitoring and log collection system (or systems). The advantage is that the code is all free. The downside is that this takes times – both initially when setting it up and later when maintaining. That’s why we built Sematext Docker Agent – a modern, Docker-aware metrics, events,and log collection agent. It runs as a tiny container on every Docker host and collects logs, metrics and events for all cluster nodes and all containers. It discovers all containers (one pod might contain multiple containers) including containers for Kubernetes core services, if core services are deployed in Docker containers. After its deployment, all logs and metrics are immediately available out of the box. Why is this valuable? Because it means you don’t have to spend the next N hours or days figuring out which data to collect and how to chart it, plus you don’t need the resources to maintain your own logging and monitoring infrastructure. Let’s see how to deploy this agent. Kubernetes provides DeamonSets, which ensure pods are added to nodes as nodes are added to the cluster. We can use this to easily deploy Sematext Agent to each cluster node! Sematext Docker Agent is configured via environment variables. Get a free account at apps.sematext.com, if you don’t have one already. Create an SPM App of type “Docker” to obtain the SPM App Token. SPM App will hold your Kubernetes performance metrics and event. Create a Logsene App to obtain the Logsene App Token. Logsene App will hold your Kubernetes logs. Edit values of LOGSENE_TOKEN and SPM_TOKEN in the DaemonSet definition as shown below. value: "REPLACE THIS WITH YOUR SPM TOKEN"
value: "REPLACE THIS WITH YOUR LOGSENE TOKEN"
The status “ImageNotReady” or “ContainerCreating” might be visible for a short time because Kubernetes must download the image for sematext/sematext-agent-docker first. The setting imagePullPolicy: “Always” specified in sematext-agent-daemonset.yml makes sure that Sematext Agent gets updated automatically using the image from Docker-Hub. Less than a minute after the deployment you should see your Kubernetes metrics and logs! Below are screenshots of various out of the box reports and explanations of various metrics’ meanings! Each detailed chart has filter options for Node, Docker Image, and Docker Container. As Kubernetes uses the pod name in the name of the Docker Containers a search by pod name in the Docker Container filter makes it easy to select all containers for a specific pod. Host Metrics such as CPU, Memory and Disk space usage. Docker images and containers consume more disk space than regular processes installed on a host. For example, an application image might include a Linux operating system and might have a size of 150-700 MB depending on the size of the base image and installed tools in the container. Data containers consume disk space on the host as well. In our experience watching the disk space and using cleanup tools is essential for continuous operations of Docker hosts. Container CPU usage and throttled CPU time. The CPU usage can be limited by CPU shares – unlike memory, CPU usage it is not a hard limit. Containers might use more CPU as long the resource is available, but in situations where other containers need the CPU limits apply and the CPU gets throttled to the limit. There are more metrics to watch, like disk I/O throughput, Network Throughput and Network errors for containers, but let’s continue by looking at Kubernetes Logs next. Sematext Docker Agent extracts this information from the Docker container names and tags all logs with the information mentioned above. Having these data extracted in individual fields makes it is very easy to watch logs of deployed pods, build reports from logs, quickly narrow down to problematic pods while troubleshooting, and so on! If Kubernetes core components (such as kubelet, proxy, api server) are deployed via Docker the Sematext Docker Agent will collect Kubernetes core components logs as well. Most of those topics are described in our post Innovative Docker Log Management and are relevant for Kubernetes log management as well. If you want to learn more about Docker monitoring, we’ve described that in Docker Key Metrics. If you’d like to learn even more about Docker Monitoring and Logging stay tuned on sematext.com/blog or follow @sematext. To monitor your Docker and Kubernetes environments, any of Sematext’s other pre-built integrations, your app’s custom metrics, or your Docker logs, sign up for a free 30-day trial account below.